It’s great to have a partner in life and I hope that everyone has one that they can depend on to do things for them even it’s just blogging for them. If you haven’t noticed, Paul has taken a more active role here. He’s been blogging regularly and while he doesn’t respond to comments (he apologizes for it profusely), he takes direction very good. Try to take some without your hand in it. Closeups are nice but can you try different angles? Can you go back and take a photo of the sign? As for me, I’ve been keeping myself busy and not taken up one job, but many. After six months of unemployment and going, there’s not one job that I find satisfying or pays the bills. A few jobs allow me to work from home but there are others where I’m gone for a full work day and I return to work some more. It’s not an ideal situation but knowing that Paul is here to do some writing is a relief. Because of that, I wanted to bake him a batch of cookies. Cookies are among his faaaavvvoooorite things. 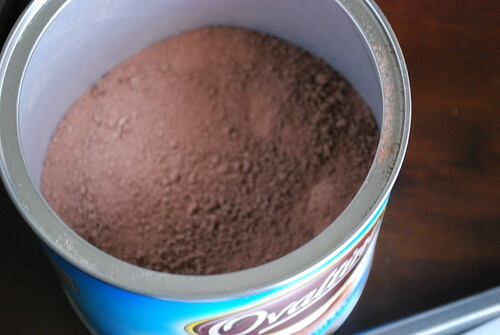 And he also loves Ovaltine chocolate drink mix (not the malt version). There must have been something implanted into his self-consciousness as a child because he great dislike Nestle and Hershey’s. (I really can’t tell the difference in taste.) For our wedding, one of the cupcake flavors offered had Ovaltine. 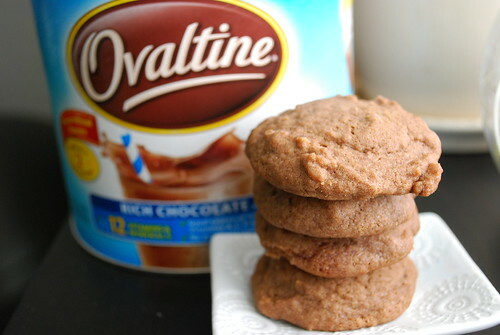 So it was natural decision to bake up a batch of cookies using Ovaltine and we always have Ovaltine in the house. I had been playing with a few recipes and this version bakes up puffier and lighter than most cookies because of the use of corn starch. Preheat oven to 375 degrees. Line cookie sheets with parchment paper or Silpat. 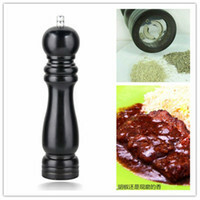 In a medium bowl, combine flour, cornstarch, baking soda, and salt. Slowly add flour mixture to the butter and sugar until thoroughly combined. Using a tablespoon, scoop cookie dough onto cookie sheet. Bake for 10-12 minutes. Let cool for 3 minutes on the baking sheet before transferring to wire racks to cool completely. Paul has been doing great blogging for you. I can’t wait to read more from him. I’ve seen Ovalitine but never tried it. Thanks! I’m glad he’s married to me. Yay for Paul! Cornstarch is like this magical ingredient for making soft, puffy cookies. I love it. I don’t remember the last time I even had Ovaltine, mostly Ovaltine makes me think of a Christmas Story when he got the decoder ring! I totally forgot that was mentioned in the movie!